"Program puts more emphasis on business experience than classroom time." continues Grand Rapids Business Journal. Business professionals interested in earning an MBA can now be graded based on their proficiency of material rather than time spent in a classroom. 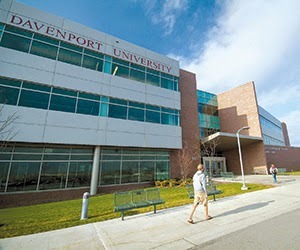 Davenport MBA students are tested for their understanding of materials, which could shave time off their degree track. Davenport University announced Oct. 6 that its Donald W. Maine College of Business is launching an online competency-based Master of Business Administration program in January 2015 that is tailored for experienced business professionals. The competency-based MBA allows students to earn credit based on their proficiency of a certain subject matter through online assessments to complete the curriculum at a self-motivated pace. Designed for experienced professionals, prospective students are required to have at least three years of experience in a business field. Depending on transfer credits and prior experience, a student is able to earn an MBA in less than a year, according to the press release. Irene Bembenista, interim dean of the college of business, said the competency-based MBA is a completely different approach to graduate education and is the first of its kind in Michigan. “We are eager to offer this online program to business professionals wherever they may be, helping them prepare for accelerated career advancement in a more cost-effective way,” said Bembenista in the release. Brian Miller, vice president of IT services, chief information officer and interim dean for Davenport Online, said the program allows the university to measure a student’s proficiency and provide credit based on knowledge rather than time spent in a classroom. With a framework of more than 80 modules comprising 14 competency areas, students will work with a faculty coach to help design a customized degree plan, and receive topic materials and related information from a modular facilitator. The 14 competencies were identified as core subject areas of a MBA program, such as leadership and management, according to Miller.